Is yours (or someone else’s) desk sorely in need of direction? Here’s what it needs: a Brass Compass ($80) in a box from Orvis. 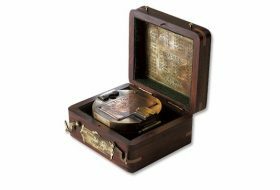 Modelled after an antique pocket compass, it’s set in a rosewood box with brass finishing.